Karnataka Chief Minister K Siddaramaiah's atheism is not a new trend in Indian politics, points out Archis Mohan. 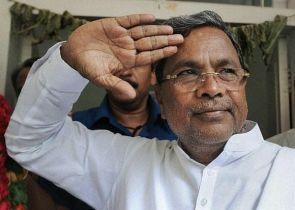 K Siddaramaiah, a rare Indian politician who wears his atheism on his sleeve, took the oath as the next chief minister of Karnataka on Monday by solemnly affirming to bear true faith and allegiance to the Constitution of India. Siddaramaiah's atheism may not have been noteworthy if the news of his election on Friday as the next chief minister of Karnataka had not been drowned out by footage on television channels of Pawan Kumar Bansal and his wife feeding a goat at their New Delhi home, ostensibly to propitiate Gods and ward off 'evil'. Bansal quit as the railways minister hours later. And in some contrast the same day in Bangalore, the Congress Legislature Party selected atheist Siddaramaiah to be their leader. Incidentally, Defence Minister A K Antony, yet another atheist, headed the group of observers comprising senior Congress politicians who oversaw the process. Antony and Siddarammaiah are politicians known to stay away from such stratagems as feeding goats or relying on soothsayers to save their kursi. Interestingly, both Karnataka and especially Antony's home state Kerala have had a tradition of atheist politicians. S Nijalingappa, the Karnataka chief minister in the 1950s and 1960s and credited as the maker of modern Karnataka, was an avowed atheist. In Kerala, the influence of Communism meant a legion of atheist politicians like E M S Namboodiripad, E K Nayanar, V S Achuthanandan, etc. But Antony isn't the lone atheist in the central Cabinet. He has such figures as Finance Minister P Chidambaram, Urban Development Minister S Jaipal Reddy, Home Minister Sushilkumar Shinde, Petroleum Minister M Veerappa Moily and Road Transport and Highways Minister C P Joshi for company. In 2009, all of them took their oaths of office solemnly affirming their faith in the Constitution and not in the name of God. And then there are others like Rural Development Minister Jairam Ramesh who calls himself a Hind-Budh, but shocked many of his ilk of believers when he advised that people should construct toilets instead of temples. While these politicians may come across as exceptions, there was a time in the first two decades of Indian democracy when atheism seemed more of a rule for the leading lights of the Indian political landscape. None other than Prime Minister Jawaharlal Nehru led the atheistic brigade. He being just one of a pantheon of towering Socialist, Congress and Communist leaders, all of them avowed atheists -- Ram Manohar Lohia, Jayaprakash Narayan, A K Gopalan, V K Krishna Menon, etc. It was also the time in Tamil Nadu that E V Ramaswamy Periyar led the Dravidian movement with rationalism being its bedrock. Similarly, Periyar was virulently anti-God and famously said that only barbarians believed in God. Some year back, the then Tamil Nadu chief minister M Karunanidhi, also a follower of Periyar, raised hackles when he said Lord Rama was a myth. Interestingly, even Vinayak Damodar 'Veer' Savarkar was an atheist. None of these yesteryear politicians were known to visit temples or worship. But our current day politicians like Siddaramaiah, Antony, Chidambaram and others keep atheism as their private faith and are known to visit temples, dargahs and churches. Antony is known to visit a church in his village at least once a year along with his family to take part in the prayer in his departed mother's memory. Chidambaram also visits the famous hill shrine of Lord Venkateswara at Tirumala near Tirupathi once in a while. If not the fear of God, but the fear of wrath of God's followers -- the voters -- that probably makes even the most atheist of our politicians to bow before Gods, if not at their homes than at least in public. Are Pakistan's youth giving up Islam?